This is one of those recipes that I was quite apprehensive about trying. 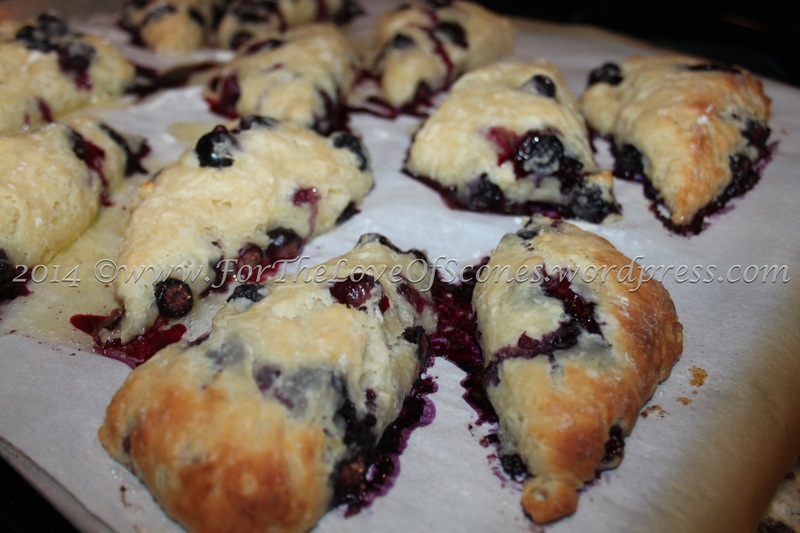 But…I got a request for something “wild and crazy,” and ricotta fruit scones sounded a bit adventurous to me without being guaranteed to be a total flop. 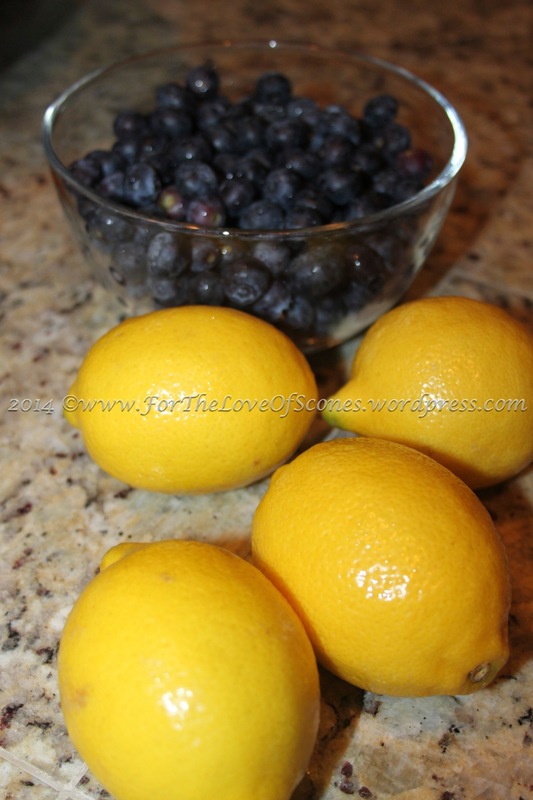 Lemon and blueberry obviously complement each other well. So the only real adventure in this scone is one of the other main ingredients: ricotta cheese. 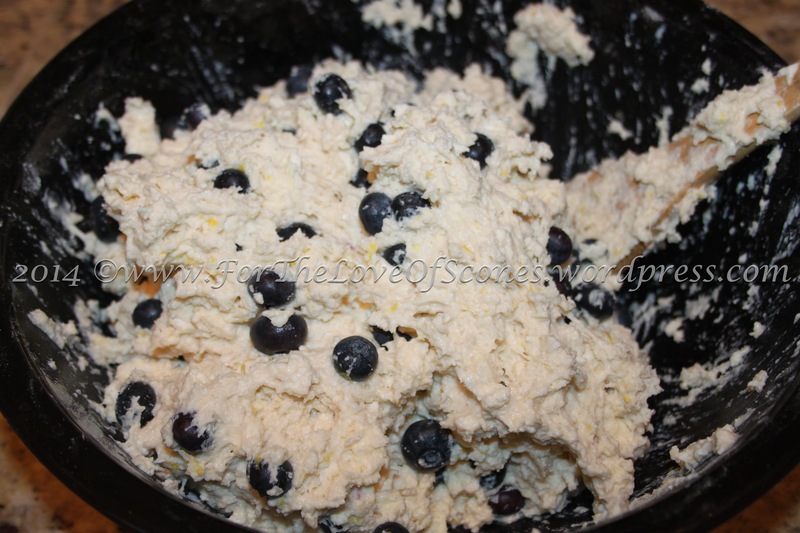 1) Combine the dry ingredients and whisk to mix. 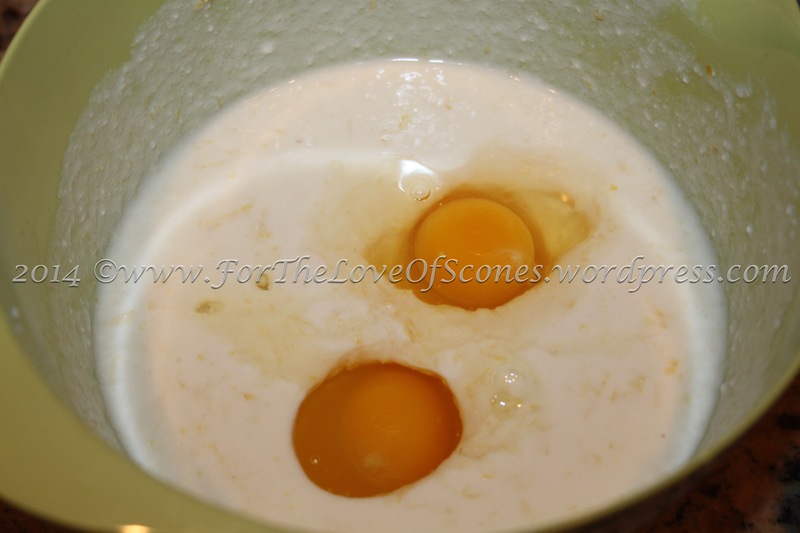 2) Combine the buttermilk, egg, lemon emulsion/extract, lemon juice, and lemon zest. Whisk well to mix. 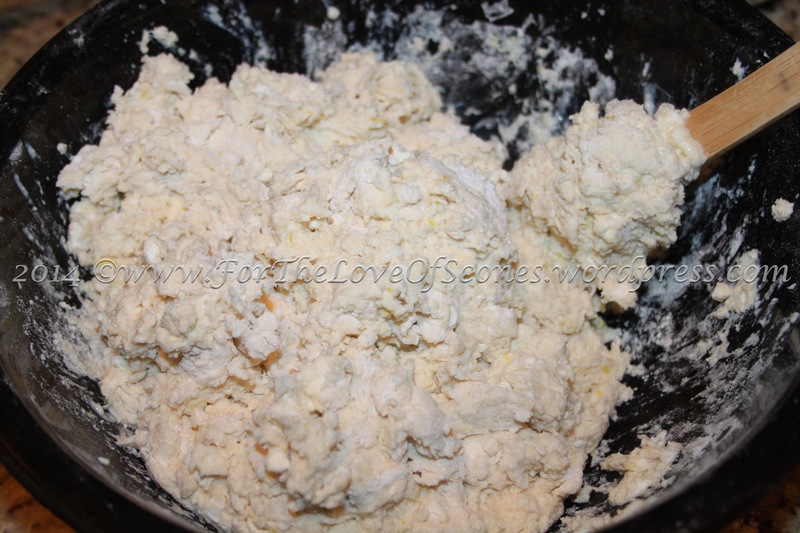 Add the ricotta and whisk well until relatively even. A few small lumps of ricotta are fine. 3) Add the chopped, cold butter to the dry ingredients and blend in using a pastry blender until the pieces of butter are pea-sized or a bit smaller. 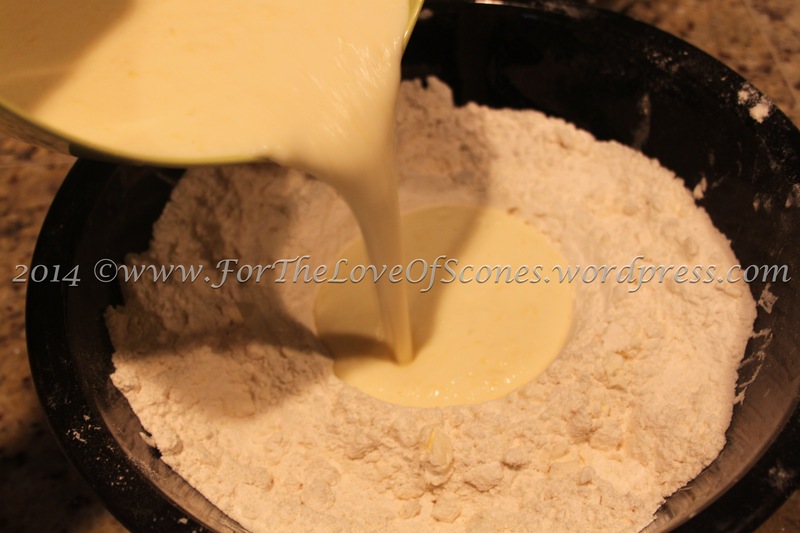 4) Make a well in the dry ingredients and pour the liquid into the well. Using a wooden spoon, scoop from the outside to the inside and gently fold the liquid in. It should be a wet, sticky dough. A few dry crumbs at the bottom are okay. 5) Add the blueberries and fold in as above, using a gentle hand with a wooden spoon or a rubber spatula to avoid crushing the berries. A few dry crumbs are still okay. 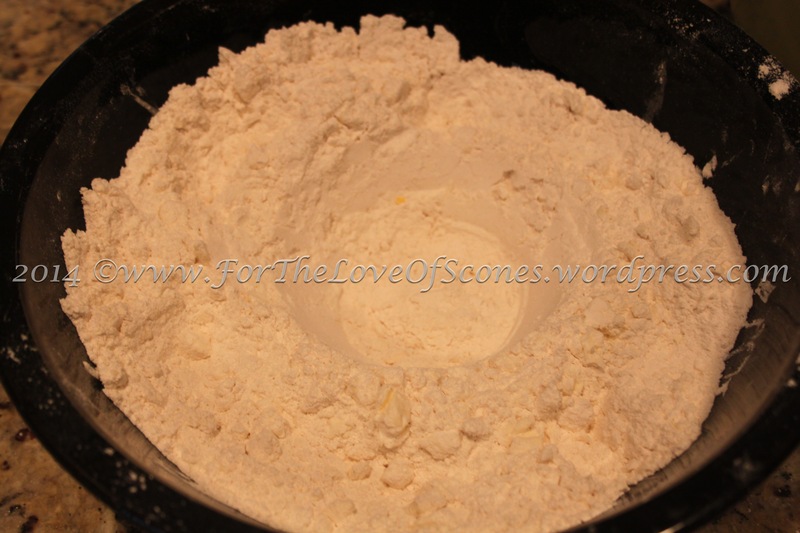 6) Turn the dough out onto a well-floured countertop, turning out any dry crumbs onto the top of the dough. Using your fingertips (best if floured), gently tuck the dough over itself a few times and give it a few kneads until it comes together. 7) Pat into a long log about one scone length in width and 1/2-inch high. You should get a log about four or five scone widths in length. Using a sharp, floured knife, cut into four or five squares, and then cut each square into two triangles. 8) Place on a parchment-lined baking sheet about 2 inches apart from one another. 9) Bake at 400°F for 20-30 minutes, or until golden brown on top. 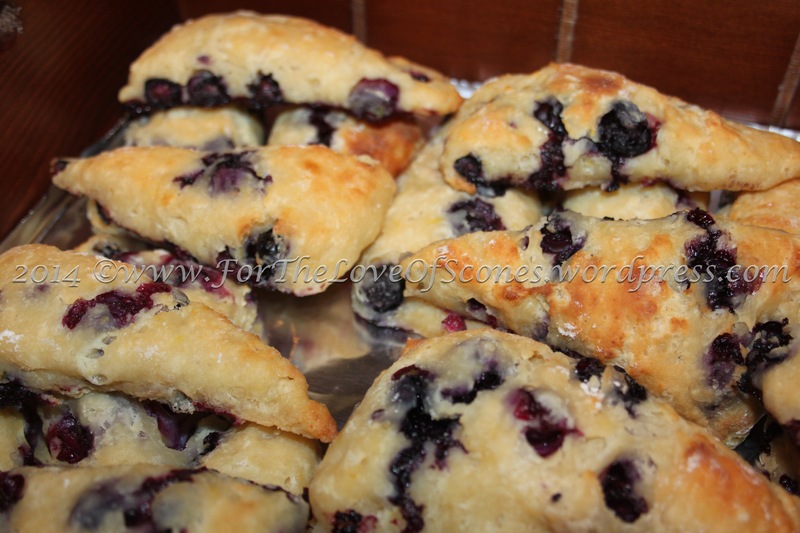 10) Remove from oven and place scones onto a towel-lined cooling rack. 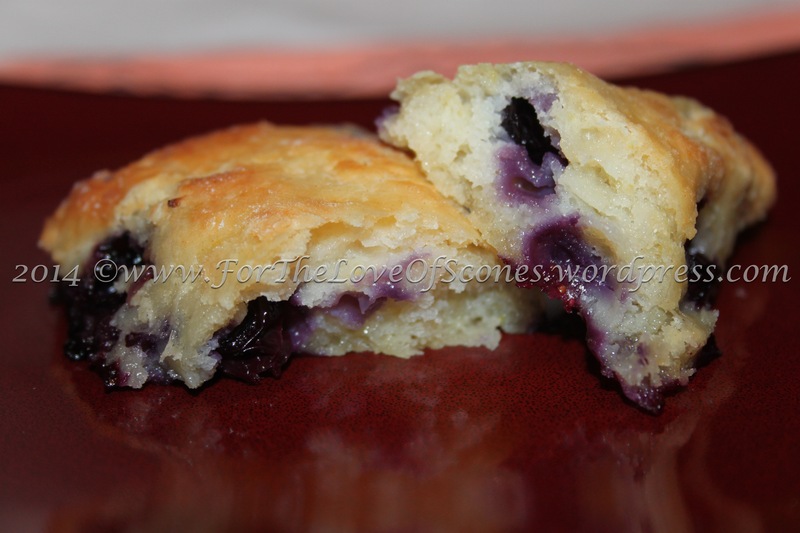 Cover or tuck in the scones with another towel and allow to cool. Best served warm. Measure out your ingredients. *My picture shows a double recipe. Zest all four lemons, but only juice three. 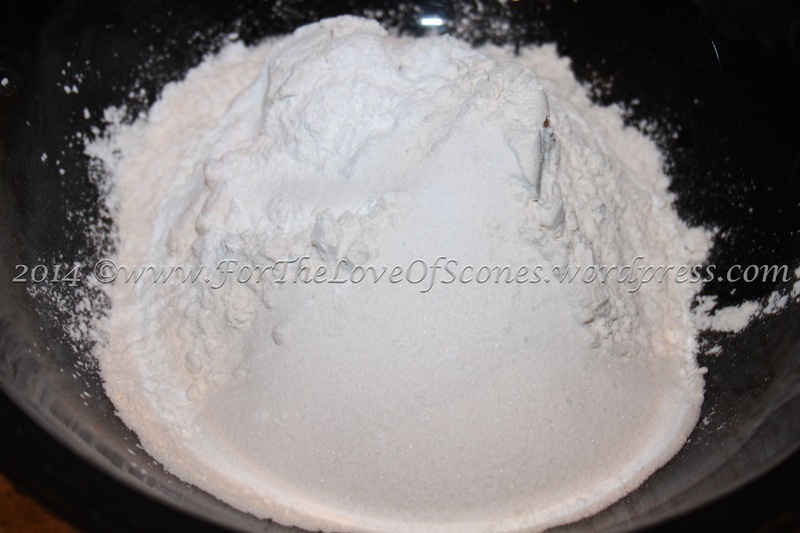 Combine your dry ingredients: flour, baking powder, baking soda, salt, and sugar. 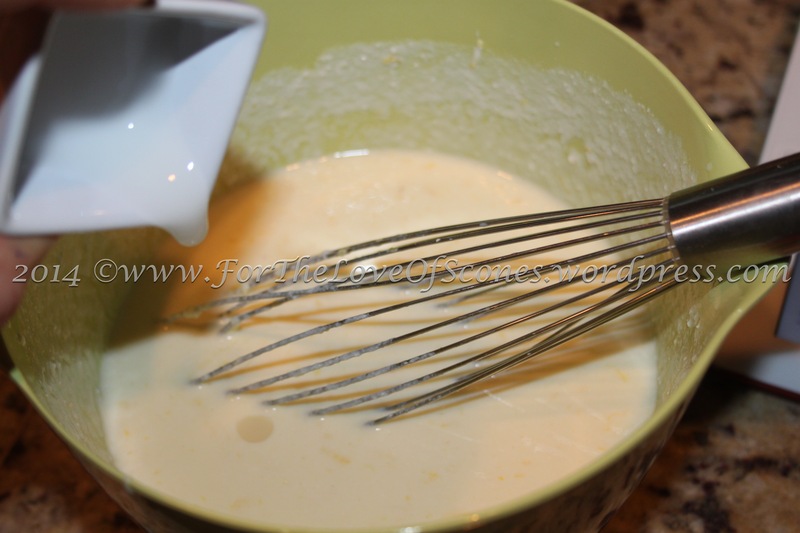 Add the eggs to the buttermilk mixture & whisk well. 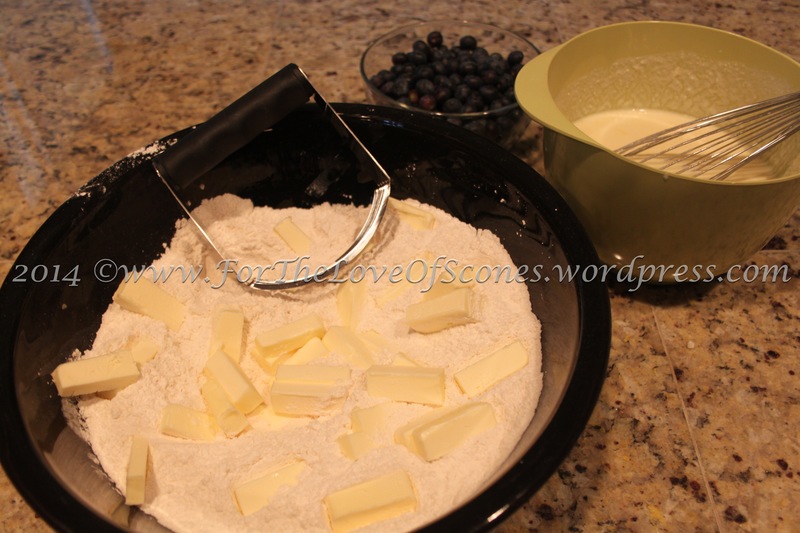 Add the cold, chopped butter to the dry ingredients and mix with a pastry blender. Pea-sized chunks (or a little smaller) of butter are fine. 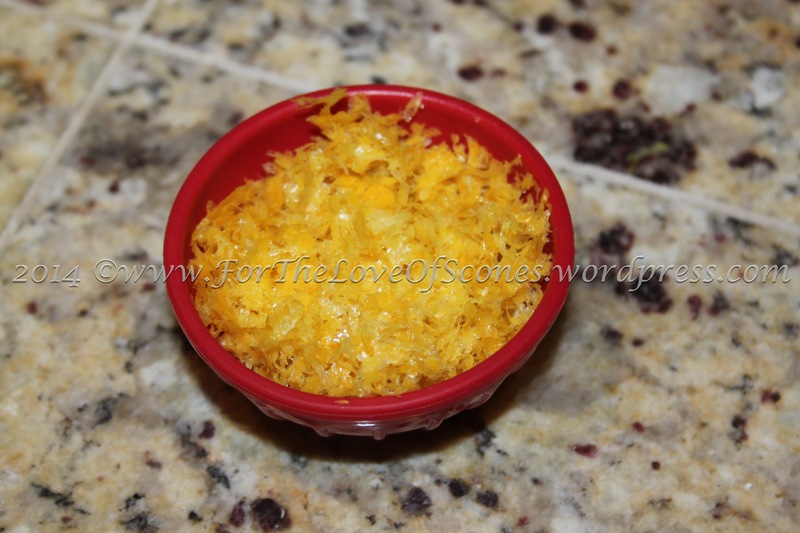 Mix with a wooden spoon by folding the outside into the liquid in the middle until only a few dry crumbs remain. 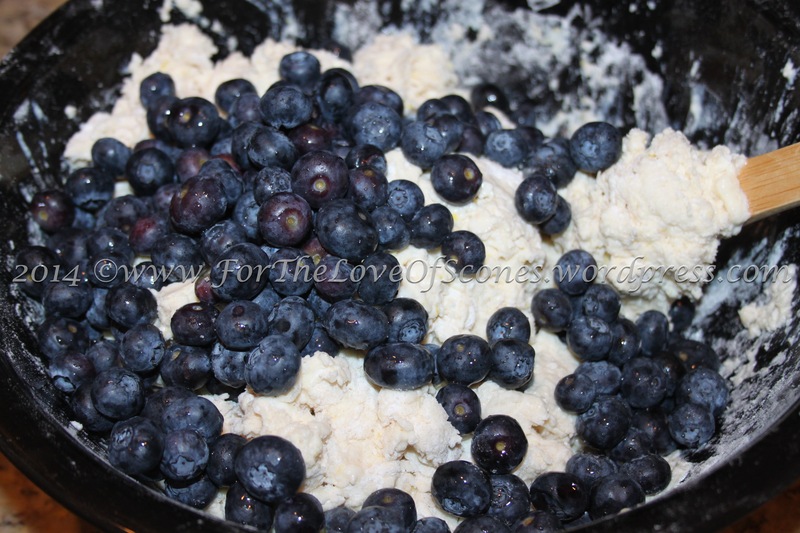 Add the blueberries and gently fold them in using the same technique you used to incorporate the liquid. 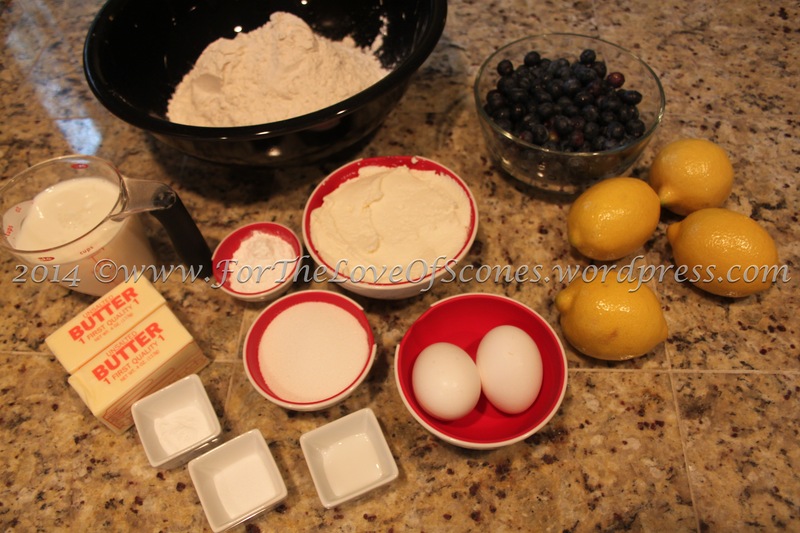 Mix until the blueberries are evenly distributed. 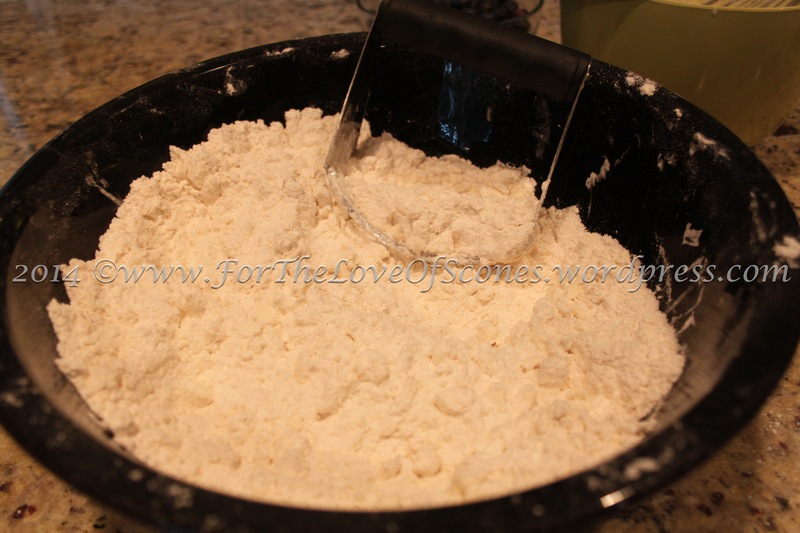 Turn the dough out onto a well-floured countertop and give a few gentle kneads to incorporate any remaining crumbs. 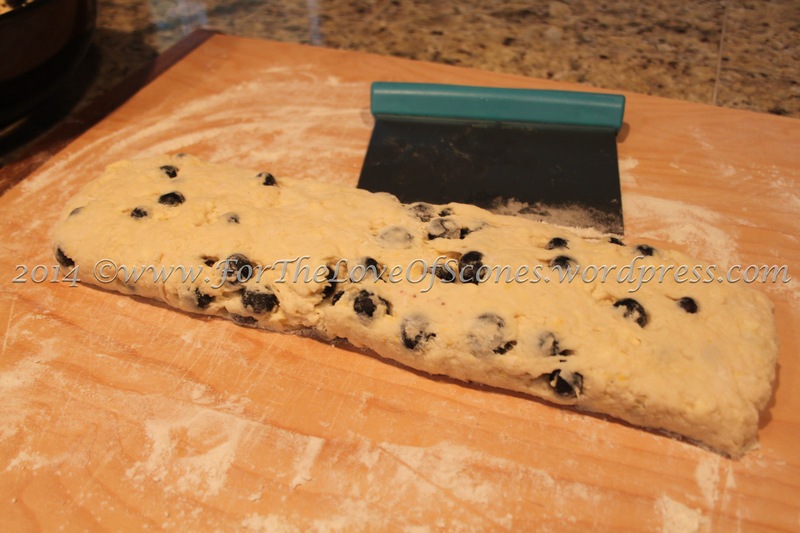 Flatten out into a log about 1/2-inch high and one scone length in width. 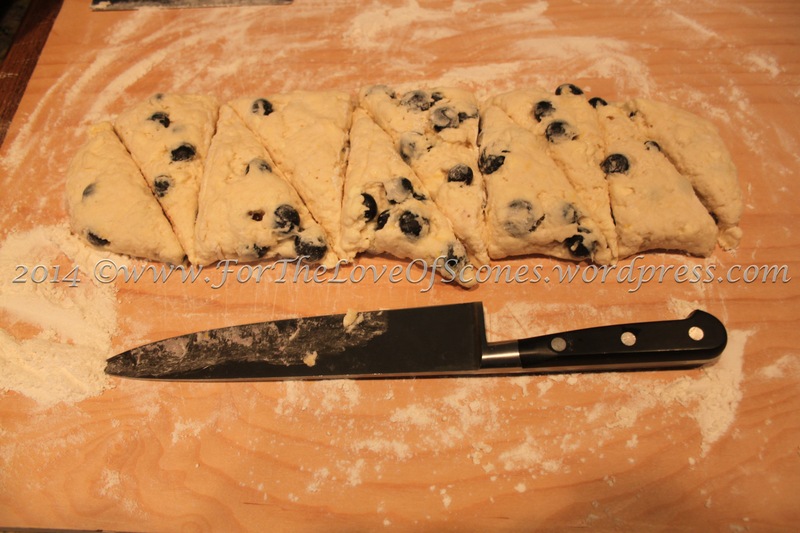 Cut the scones with a sharp, floured knife. 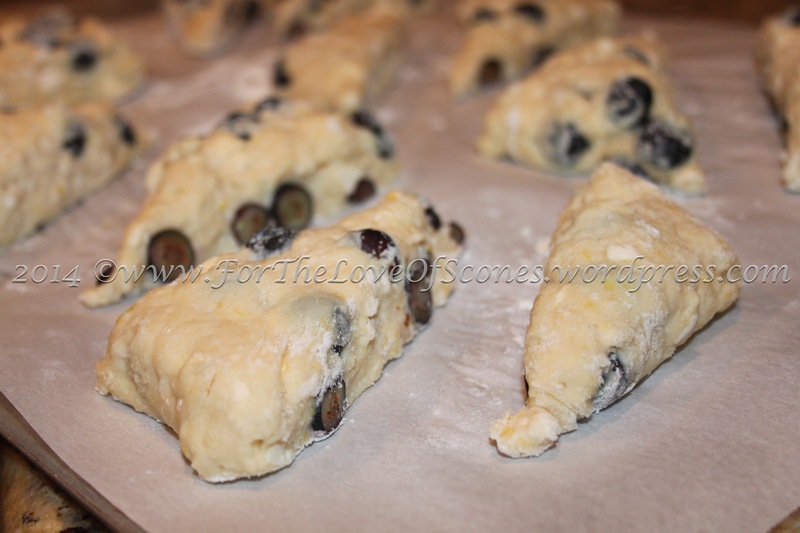 Place on the parchment-lined baking sheet and put in the freezer for 30 minutes to chill. Bake until golden around the edges.